Cecil Amos Witney was the fifth eldest of eight sons of George Harry and Charlotte Mary (née Pitcher). He was born in Stokenchurch, Oxfordshire, now Buckinghamshire, on 6th June 1882 and baptised there on 27th July. His father worked in the chair making industry. After leaving school, Cecil started a career as a clerk at Messrs Hall & Co’s store in Thame. He moved to the office of solicitor William Parker and subsequently to solicitors Messrs Lightfoot and Lowndes. When Charles Simmons became clerk of Thame Urban & Rural District Council, Cecil took up the position as his assistant, where he remained until the outbreak of the war. He was permanent secretary of the Thame Goodfellows Society and a member of the Thame Football and Cricket Clubs, reportedly “good at both”. 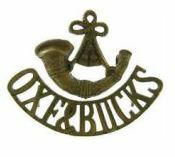 In 1912 Cecil joined the Oxford and Bucks Light Infantry, 4th Battalion (Territorials) and quickly rose to the rank of Lance Corporal. When they were mobilised in August 1914, Cecil (Regt No 1865) joined them at Oxford and moved with them to Writtle, near Chelmsford, Essex. In December he was promoted to Corporal. By the time the Battalion, re-designated the 1/4th, embarked for France in March 1915 Cecil had been transferred to the 2/4th Battalion. The Battalion remained in England and Cecil was promoted to Company Sergeant Major of “A” Company in December. The following year the 2/4th Battalion went to France with the 184th Brigade of the 61st Division, landing at Le Havre in May 1916. They remained in northern France for the next few months and took part in the attack at Fromelles, an unsuccessful diversionary tactic during the Battle of the Somme. It was not until mid-November, when the main battle had ended that they marched down to Albert and took up positions in the trenches on the Somme. At midnight on Good Friday 1917, “A” Company was the lead attacking company in an advance towards St Quentin. The attack proved to be a failure, uncut wire forcing the attacking companies to withdraw. 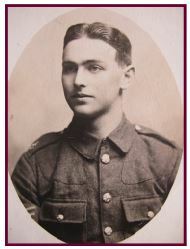 Cecil was one of ten men killed and over 40 wounded on 7th April. 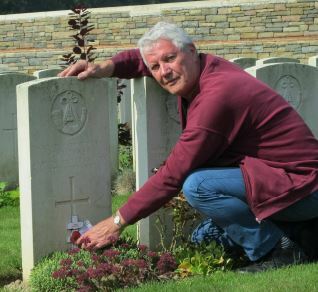 He was 35 years old and buried near the spot where he fell, but after the war his body was reinterred in a Commonwealth War Graves Cemetery close by. 200230 Company Sergeant Major Cecil Amos Witney, Oxford and Bucks Light Infantry, is buried in Vadencourt British Cemetery, Maissemy, Aisne. He is remembered in Thame on the War Memorial and on the Memorial Boards of St Mary’s Church and All Saints’ Church.